Have you ever turned on a whirlpool and seen a bunch of nasty black gunk shoot out of the jets? I've heard it's either mold or some kind of bacteria that feeds off dead skin cells. Personally, I don't care what the stuff is - it's gross no matter what. If the water in the circulation piping sits stagnant for a while, there's a good chance that this black gunk will start growing; it can take as little as a month for this to happen. I've heard some home inspectors say that if this black gunk comes out of the jets, they won't even drain the water in the tub if they have to stick their arm in, because they're too grossed out. Personally, I have no such issues and I prefer to leave the house in the same condition that I found it in, if I can. American Standard: Once a month, fill the whirlpool with warm water, add two teaspoons of powdered automatic dishwasher detergent and 4 ounces of bleach, and run the system for two minutes. Drain the tub, fill it again with cold water, and run it again for five minutes. Kohler: Twice a month or more, fill the whirlpool with warm water, add two teaspoons of powdered automatic dishwasher detergent and 20 ounces of bleach, and run the system for five to ten minutes. 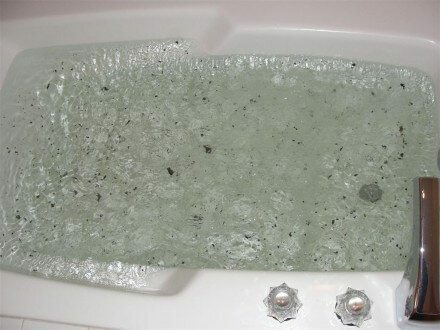 Jacuzzi: Twice a month or more, clean the whirlpool with their exclusive cleaning product, called Systems Clean. My two cents: Maintaining a whirlpool tub is a lot of work. Not as much as a spa, but still... who would have thought? Oh, and to Jacuzzi for only giving instructions to clean with their exclusive cleaning product - boo. If you're planning to sell your home and you have a whirlpool tub, take the time to clean the system out, especially if you never use it. 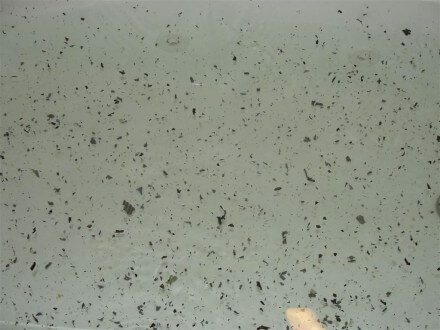 If a bunch of black gunk comes out of the jets when the home inspector tests the system in front of the buyers, they're really going to be grossed out with your bathroom.